And this is the last of it. On the way to Felde, she spots something in the distance which she tells her companions about. It turned out to be a group of Jaal'daryas who got closer as they were curious about the turtle. The group on the summon decided to follow the Jaals after it turns out they were going in the wrong direction because Kharla fell asleep. When they arrived in Felde, they gained the attention of Larvova, Finol and Labran'che. She enters the party with Anjin who disguises himself as a servant. Fame then challenges Kyo'nne to a singing contest, surprising her. Khal'harror toys with Fame for a brief moment before crushing her hopes, earning a laugh from Frisk. Kyo'nne invites Fame to her room so they can discuss the rival business there. Ran'diirk then walks past her and after Sarai tells him to go after Kiel, Fame tries to warn Kiel. On the way to Felde, he eavesdrops on Chrys' and Shinae's conversation with Sindas, Bast and Kiel before getting interrupted by Fame's announcement that they have company. When the Jaals greeted, he was confused by what gender Erel was supposed to be. The group on the summon decided to follow the Jaals after it turns out they were going in the wrong direction because Kharla fell asleep. When they arrived in Felde, they gained the attention of Larvova, Finol and Labran'che. Njack helps himself to some of the food Jethel was serving. After Kiel made a vulgar joke regarding Zala, he and Sindas joins in on the punchline. Njack later follows Kiel to go after Kharla where he liked the sight of Kharla and Khaless in their outfits. After Ran'dirrk's failed attempt to kill Snad, he tags along with Kiel and Sindas upstairs. During Snadyarune's speech, he witnesses Snad choose Chrys'tel as part of her demonstration. When Shodun gave the command, he kneeled as best he could given his bodyshape. On the way to Felde, he eavesdrops on Chrys' and Shinae's conversation with Njack, Bast and Kiel before getting interrupted by Fame's announcement that they have company. When the Jaals greeted, he said that he didn't know the Jaals dealt with demons. The group on the summon decided to follow the Jaals after it turns out they were going in the wrong direction because Kharla fell asleep. When they arrived in Felde, they gained the attention of Larvova, Finol and Labran'che. After Kiel made a vulgar joke regarding Zala, he and Njack joined in on the punchline. Sindas later follows Kiel to go after Kharla where he liked the sight of Kharla and Khaless in their outfits. After Ran'diirk’s failed attempt to kill Snad, he carries Kiel upstairs with Njack tagging along with them. During Snadyarune's speech, he witnesses Snad choose Chrys'tel as part of her demonstration. When Shodun gave the command, he kneeled. On the way to Felde, she eavesdrops on Chrys' and Shinae's conversation with Sindas, Njack and Kiel before getting interrupted by Fame’s announcement that they have company. When the Jaals greeted them, Bast noted that Fia'nova was heavily tainted. The group on the summon decided to follow the Jaals after it turns out they were going in the wrong direction because Kharla fell asleep. When they arrived in Felde, they gained the attention of Larvova, Finol and Labran'che. She offers Shinae some beer after Kiel made a vulgar joke regarding Zala. She follows Shinae around and after Shinae gets volatile after overhearing a conversation between Mel and Zhor, she directs Shinae's temper at herself, ending with Bast getting thrown into the water. When Shodun gave the command, she observes Shinae feeling it’s effects despite her great distance making Bast concerned. He has messy blonde hair, a brown top and red pants. His mask has a grin reminiscent of a madman. He has split personality. In his mask off mode, he seems to be normal but in his mask on mode, he becomes highly unstable. While eating a snack, Labran'che was shock to see Kiel and her group arrive in Felde when Finol tells him and Larvova so. He wonders why Kiel is here to which Larvova agrees is an interesting question. 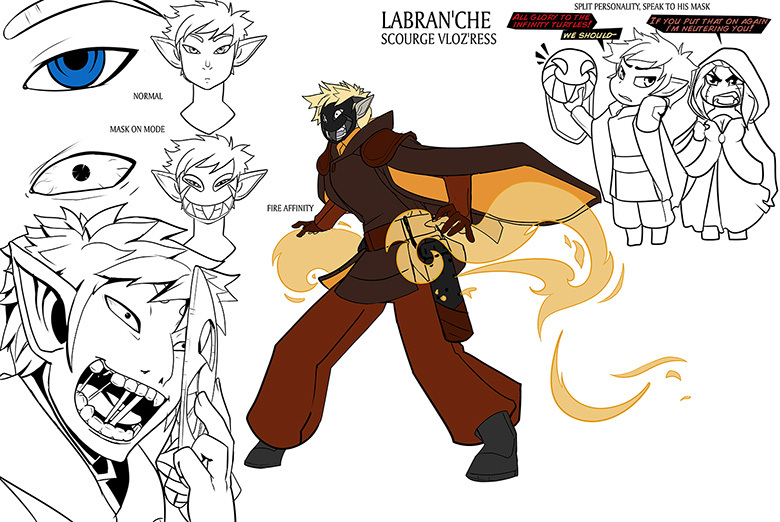 When talking to his mask, Larvova warns him against wearing it. Once they realise Kharla is there, he and Finol run for safety, leaving Larvova to calm an upset Kharla herself. They are later seen with Labran'che saying it was scary while Finol tells him to keep quite. After Ran'diirk's failed attempt to kill Snad, he and Finol are with Larvova as Snad makes her speech. When Shodun gave the command, he kneeled. "''Holy turtle, it's Kiel! What's she doing here?''" 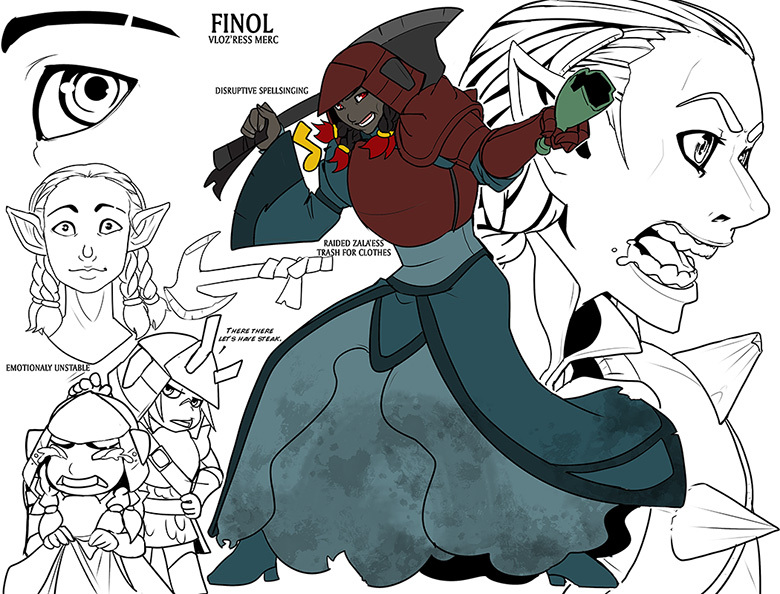 Finol wears one of Zala'ess' discarded dresses which was raided from her trash. Above that, she wears minimal protective armor. Her brown hair is tied into several braided ponytails. She happens to be an emotionally unstable person. Finol spots Kiel and her group arriving and tells Larvova about it. Once they realise Kharla is there, she and Labran'che run for safety leaving Larvova to calm an upset Kharla herself. They are later seen with Labran'che saying it was scary while Finol tells him to keep quite. After Ran'diirk's failed attempt to kill Snad, she and Labran'che are with Larvova as Snad makes her speech. When Shodun gave the command, she kneeled. "''Hah, you really fell for Kiel's haleshit.''"